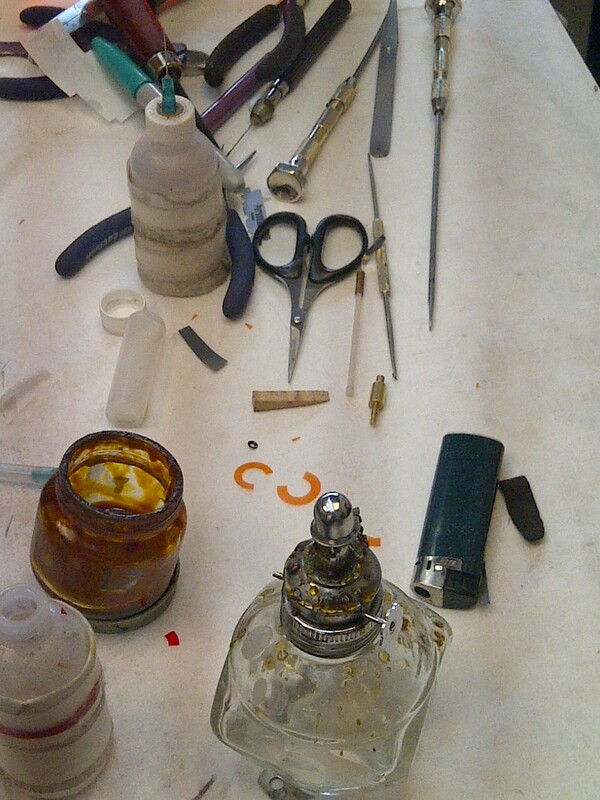 Snapshot of alcohol lamp and a variety of tools. Well, Rachel explained that she has a motor at the end of the bench -- a "bench motor." 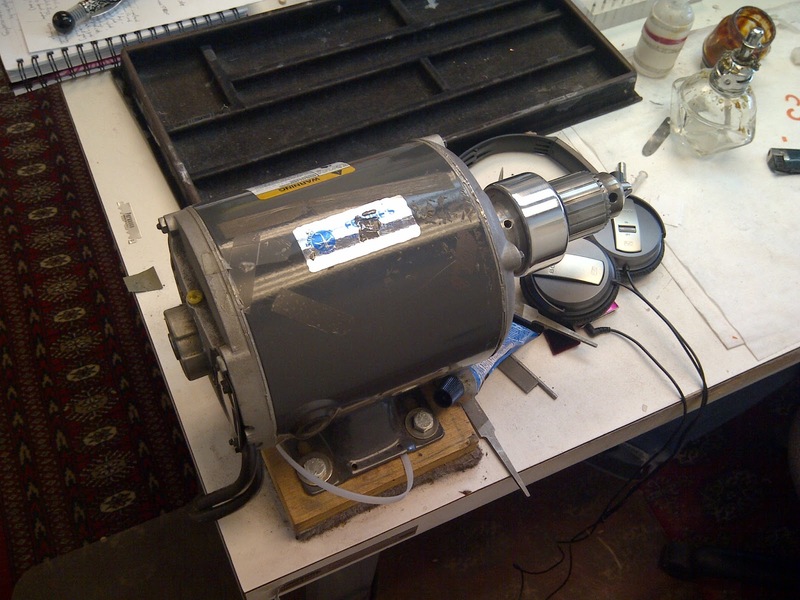 She has several attachments that go into the the motor to help her in her work. 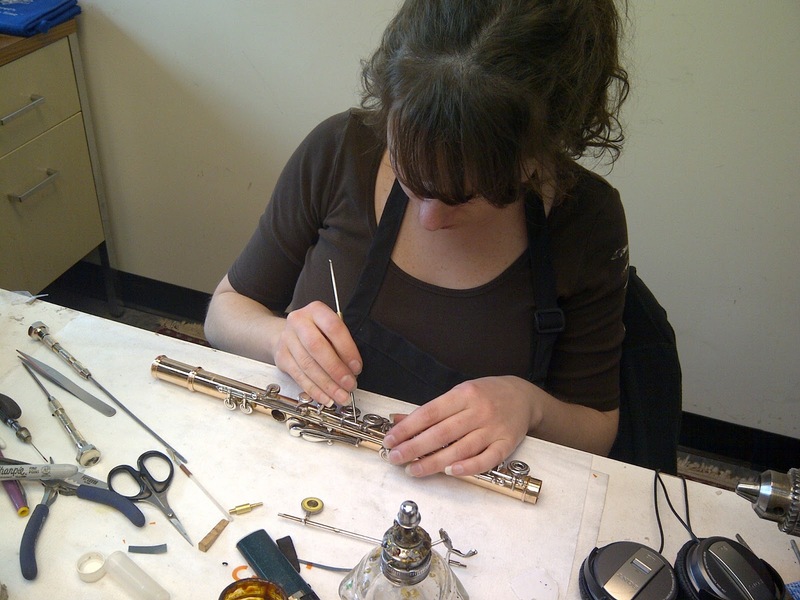 She often times uses the motor to straighten bent rods, fit pivot screws, and touch up (polish) keys (by adding various sized wheels). 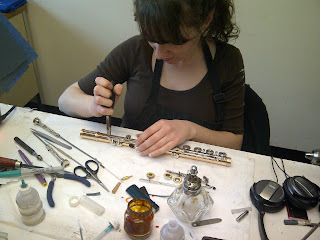 When we stopped in today, she was using the motor to shorter a mechanism tube rod. Other tools we see Rachel use quite a bit include some "common" tools and something every repair tech has -- an alcohol lamp. She uses the alcohol lamp to float pads --- both putting them in the key cups and getting them out. She also uses the lamp to solder spuds and heat up rods that are stuck. 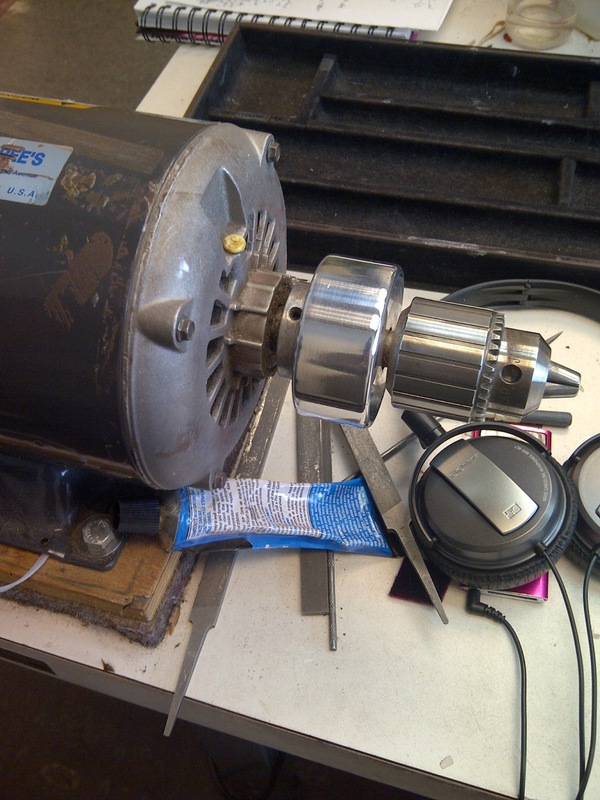 We usually see her using screwdrivers to get rods out of mechanism tubes and for pad washer screws. 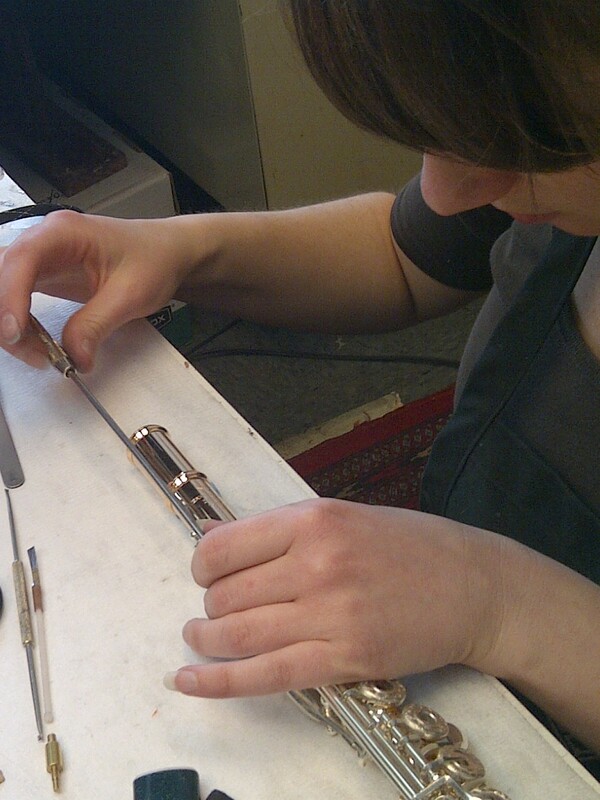 The screwdriver is often followed by pliers, which she uses to grab and pull things -- especially key mechanism rods. 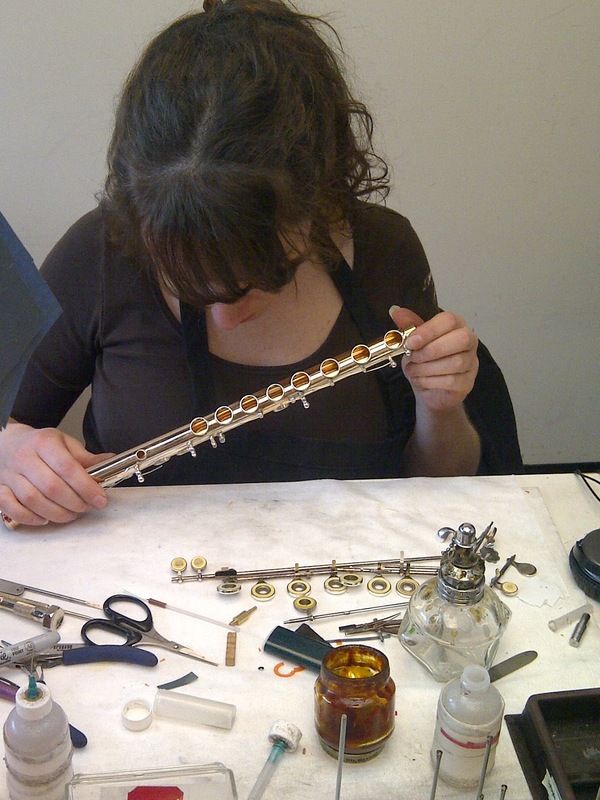 Because everything is so small when it comes to flutes and piccolos, Rachel also uses tweezers quite a bit (she says "for everything!"). Tweezers help her grab shims and pick up very small parts. When it comes to checking for proper pad seating, which she does numerous times throughout her day, she uses a feeler gauge. Finally, although it may look like a small crocheting needle, she uses a "spring hook" to attach springs and also to add or remove tension in them once they are in place. 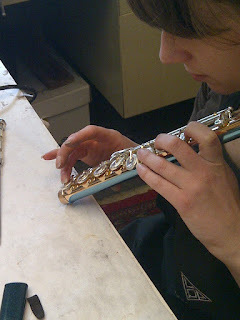 So, that -- in a nutshell -- is a glimpse of the common toolbox of our flute repair tech, Rachel! Hands are important for checking the "feel" of the mechanism -- and for so many other things! 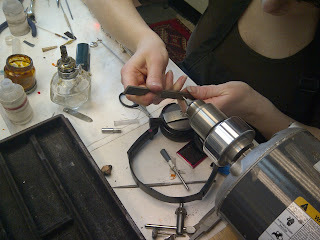 Rachel placed a mechanism rod in the tip of the motor and is now filing it to shorten it. Removing a key rod with the screwdriver. Pulling out the rod with pliers. Checking pad seating with the feeler gauge. Un-hooking springs with the spring hook. 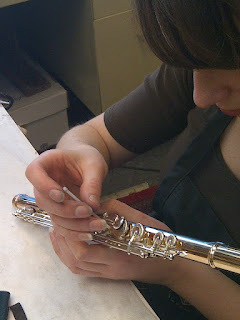 After using all those tools, the flutes often look like this -- and then everything is put back together using the tools again!